Earth 2.0 is out there – and telescope technology is going to find it. From a trickle to a torrent in the last decade, space telescopes keep on finding new and tantalising evidence of Earth-sized planets in our Milky Way galaxy. In early September 2017, researchers using data from the Hubble Space Telescope calculated that there could be water on the surface of the seven planets around TRAPPIST-1, a dwarf star the size of Jupiter discovered earlier this year. Found in the direction of the Aquarius constellation, TRAPPIST-1 is 40 light-years from Earth, which in relative terms puts it in our neighbourhood. How do astronomers know that water is there? And will space telescopes shed any more light on 'other Earths'? All seven of the TRAPPIST-1 planets were detected using the transit method; when an exoplanet passes across a star as seen from a telescope, that star dims slightly. The light signature recorded by the telescope can then be used to calculate the mass and radius of the planet. This is the science of spectroscopy, with powerful space telescopes like Hubble, Spitzer, and Kepler able to observe exoplanets across broad wavelengths, ranging from ultraviolet (UV) to infrared (IR) light. For this latest TRAPPIST-1 discovery, it's been all about detecting UV rays, which (above a certain level) can break-up water molecules. The researchers found that while the inner planets have probably lost all their water due to high UV levels, the outer planets (called e, f and g) have less UV, and are all in the habitable zone, so may contain rivers and oceans. 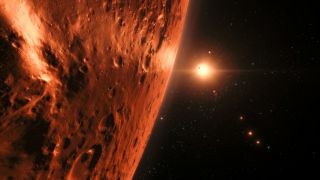 "It is exciting that we can now study the environments of individual Earth-sized planets," said Professor Peter Wheatley from the University of Warwick’s Astronomy & Astrophysics Group in the Department of Physics. "Our results suggest that water, and potentially life, could have survived in the TRAPPIST-1 system, despite the relatively intense UV and X-ray irradiation of the planets." However, despite the success of the Hubble Space Telescope and the other space telescopes, a lot of ground-based telescopes were also used to corroborate the data (Belgium's Transiting Planets and Planetesimals Small Telescope (TRAPPIST) telescope in Chile, in particular). Besides, the conclusion that there could be water on some of TRAPPIST-1's exoplanets is based on a lot of assumptions. What astronomers need in order to probe exoplanets effectively is a much more powerful space telescope. Luckily, there's one due to launch next year. After 27 years of service, Hubble is about lose its spot as the human race's most powerful eye on the cosmos. Due for launch in October 2018 from the ESA's launch pad in French Guiana, the James Webb Space Telescope (JWST) is twice as large as Hubble. Instead of orbiting Earth, it will orbit the Sun, 930,000 miles from Earth, at the L2 point to get our clearest-ever view of distant galaxies. It will do that by using a staggering 22-metre sunshield and gold-plated beryllium mirrors stretching 6.5 metres – three times larger than Hubble's – to detect IR light from the furthest depths of the known Universe in an effort to understand the Big Bang. It will also measure IR to detect what makes-up the atmospheres of exoplanets around distant stars. Its multiple cameras are also much more powerful than Hubble's, though it's too far away to be serviced by astronauts, (Hubble was famously fixed by a Space Shuttle visit in 1993). If all goes to plan, the JWST will change astronomy forever, with the TRAPPIST-1 planets first in line for a close look, but there are plans for many successors. Though little-known, the WFIRST proposed for launch in 2025 will mostly study dark energy and dark matter, but also be capable of carefully studying the atmospheres of exoplanets by blocking its view of stars nearby. Space telescopes are usually rated on the size of their mirror; Hubble has a 2.4-metre mirror, and JWST a 6.5-metre. So why not dream bigger and plan for a whopping 16-metre space telescope capable or confirming not whether life on exoplanets is possible, but whether it actually exists or not? That's exactly what astronomers are doing, with plans afoot for the Large UV/Optical/IR Surveyor (LUVOIR). Designed to occupy the same Sun orbit as the JWST, LUVOIR's 16-metre mirror would be a massive leap forward. The LUVOIR is not confirmed yet, and even when it is that will merely kick-start a 15-20 year countdown to its launch, but the momentum behind some kind of extra-large space telescope to succeed the JWST already exists. A 12-metre High-Definition Space Telescope (HDST) is proposed by the Association of Universities for Research in Astronomy (AURA). Its aim? To find Earth 2.0 – optically. Space telescopes of this massive size are what Elon Musk's SpaceX Falcon Heavy rocket was born to launch. Ground-based telescopes are often hamstrung by clouds and distorting hot air, and they're also rendered part-time by nature of being on a rotating planet, but they have a critical role to play in discovering Earth 2.0. Usually they're used to corroborate findings of space telescopes, but don't underestimate them. Not only are the mirrors even more massive, but several exoplanets have been discovered using them. So the race is on to build ever-larger ground-based 'scopes. The Giant Magellan Telescope's (GMT) 24.5-metre mirror will probe exoplanets from Chile's Las Campanas Observatory, while to the north at the European Southern Observatory's Paranal Observatory the 39-metre mirror European Extremely Large Telescope (E-ELT) is underway and due to be completed by 2024. The E-ELT will be the 'world's biggest eye on the sky', though not far behind will be the Thirty Meter Telescope (TMT) in Hawaii, and the Large Synoptic Survey Telescope (LSST) at Cerro Tololo Inter-American Observatory in Chile. The latter will use a mirror of 'only' 8.4-metres, but its whopping 3,200 megapixel wide-angle camera (that's over three billion pixels of solid state detectors) will record 15 terabytes of data every night as it catalogues 10 billion stars, their type and distance from the galactic plane. The search for Earth 2.0 will take time, telescopes and many terabytes, but it's already an unstoppable mission; it now seems certain that tech will find our twin.